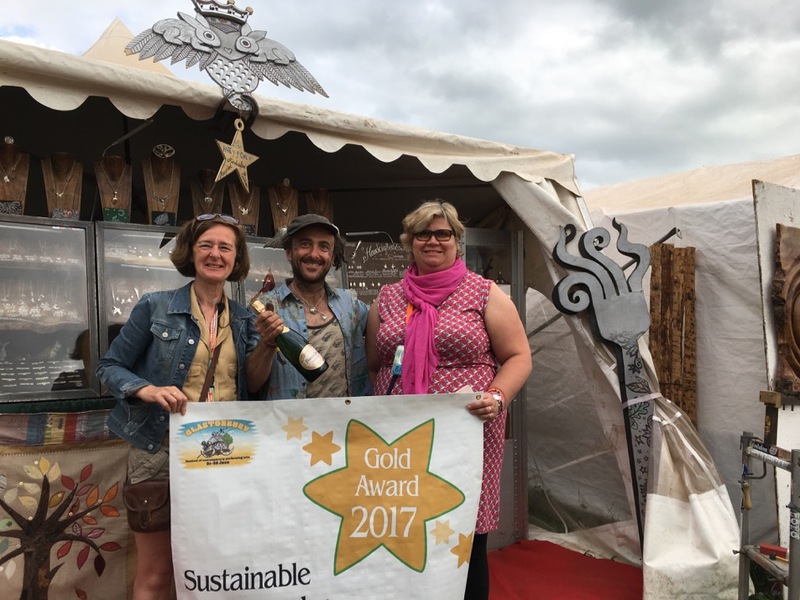 We’re pleased to announce the winners of our Traders Awards at Glastonbury 2017. Entries were initially judged from the Sustainability Survey which is completed by all our traders in advance of the festival and from this source we already had a short list before traders even got to site. Once everyone was set up and trading, our team visited those on the short list which included Hedgerow Cordials, Truly Crumptious, Shepherds Ice Cream, Coffee Box, Los Banderos and the Tiny Tea Tent. We looked carefully at our Traders ability to remain close to their values in terms of, for example, the original source of ingredients, the materials used to build the stall, the use of fuel and the choice of cleaning products. We were of course also looking for a diverse menu catering for a range of dietary requirements. 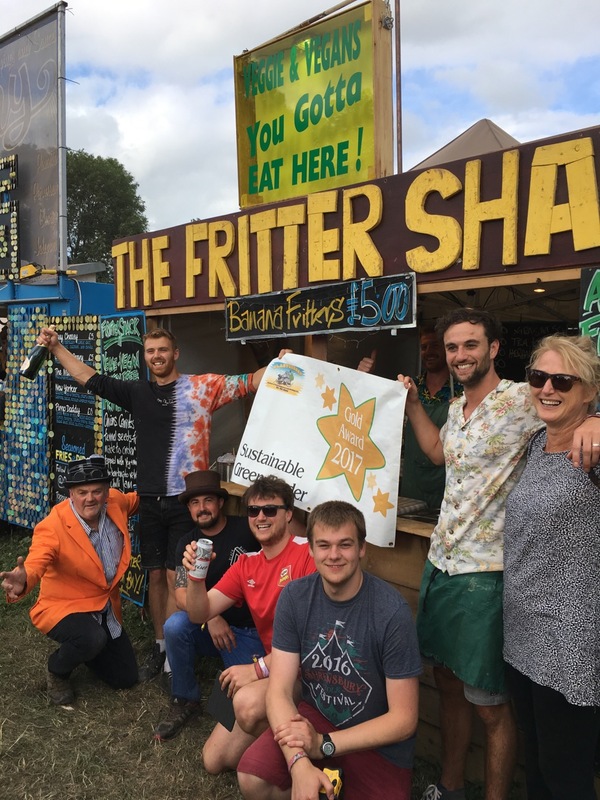 The Gold prize (which is a free pitch for the next Festival) for the most sustainable food trader was awarded to The Fritter Shack who serve a range of delicious handmade food sourced locally. The Fritter Shack caters for vegan, veggie & gluten free festival goers which is not only healthy and high quality but also fairly priced. Everything is made freshly on site by a wonderful family run team who offer this unique product. Well done to the Jones family for winning this prize. The shortlisted traders in this category were Bare Canvas, Clerestory Glass, Bumblehog Vintage, Rosa Bloom and Jazzy Frog. Competition was stiff as always but our most sustainable non-food trader award was presented to Naughty Fish, aka the Hairy Growler. Les has been trading at the festival for over 20 years and has turned a hobby into a successful business. Les is able to source unwanted and uncollectable items from local antique and coin dealers and turns these into wonderful jewellery. Display cabinets are made from unwanted recycled materials, lit by LED lights powered from batteries charged by solar power. The stall Les used may be a vinyl gazebo but it was second hand 20 years ago and is still fit for purpose! We were delighted to be able to award this prize of a free pitch for next year to Les – much deserved and we know he will continue to bring ‘love, fun and happiness’ to the festival. This is a very difficult class to judge as so many traders make a huge effort to ensure their stalls look absolutely amazing here at Glastonbury. We are very proud of how stunning our markets look. This year we asked for nominations from our Market Managers and Michael judged these after the event using the many photographs we take of each trader. The competition was very serious this year and we would like to specially mention a few. Paul Holmes transformed Legends Café – very impressive Paul, we were delighted with the changes you made to your café. Paellaria and Happy Crepes always look amazing and bring much colour to the markets. We also welcomed Teatime Collective into Big Ground who looked very beautiful as did other newcomers The Village Deli and Thai Love. 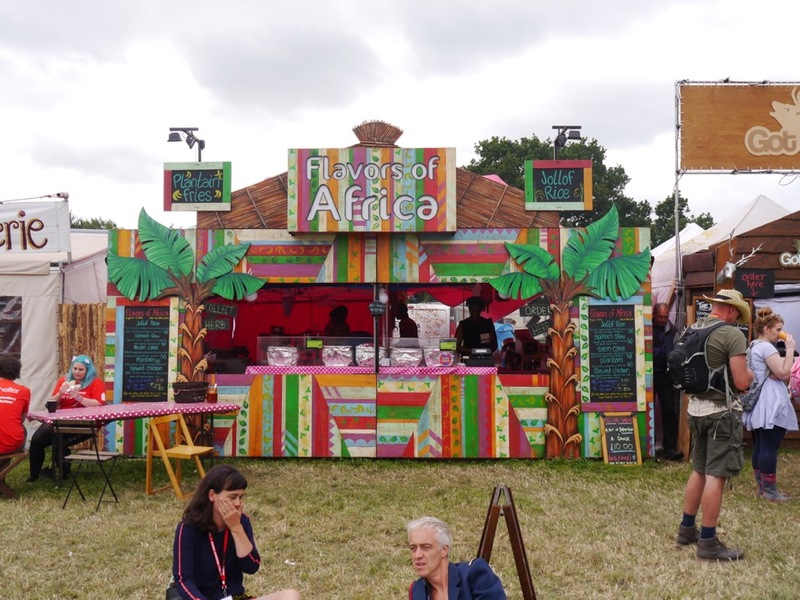 The winning prize however had to go to Flavors of Africa located in the West Holts arena for the striking colours and build quality. Bayo can look forward to a half-priced pitch in 2019. Well done and thank you to everyone for making such an effort each year.